"It was an honor just to be a finalist for the Torch Award," said Tammy Johnson, Vice President and General Manager of the Branson Tourism Center (BTC). 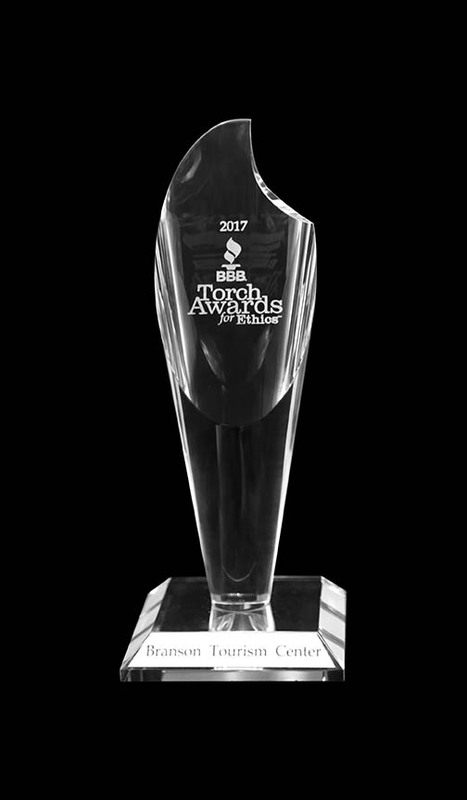 "Actually winning the BBB Torch Award, with so many worthy nominees, is as humbling as it is awesome," she added. Johnson said that it's a testimony to the dedication, effort, and character of Branson Tourism Center's employees and the Branson vendors they market for. "Our team 'makes it happen' every day as they share Branson and help its visitors have the very best Branson experience possible," she said. "The principles this award embodies, 'excellence in customer care, marketplace excellence, advancing marketplace trust and consumer leadership,' are an inherent part of our daily interactions with our customers and vendors. It's what we strive for every day," Johnson added. Over the last 14 years, BTC has sold nearly 5 million show and attraction tickets and hundreds of thousands of room-nights in the Branson marketplace building trusted relationships with its valued customers and vendors. Johnson said, "From a business and economic perspective 'what' we have done is important. Equally important however, and what winning the 'Torch Award for Marketplace Ethics" signifies, is 'how' we did it." Branson Tourism Center, established in 2003, is a marketing company specializing in packaging and individual sales of lodging, shows, attractions and restaurants within Branson to prospective visitors. It's one of the area's largest providers of Branson travel services and employs close to 100 people. It is an accredited member of the Better Business Bureau of Southwest Missouri with an A+ rating. Among other organizations, it is a member of the Student & Youth Travel Association (SYTA), American Bus Association (ABA), National Tour Association (NTA), American Society of Travel Agents (ASTA), Religious Conference Management Association (RCMA), Branson Lakes Area Chamber of Commerce (BLACC), and Branson Lakes Area Lodging Association (BLALA). Branson Tourism Center may be reached by calling 1-800-978-1999. This article was published on March 27, 2017 by Gary Groman.